It took CLIG just eleven working days to construct this set of summary annual accounts. 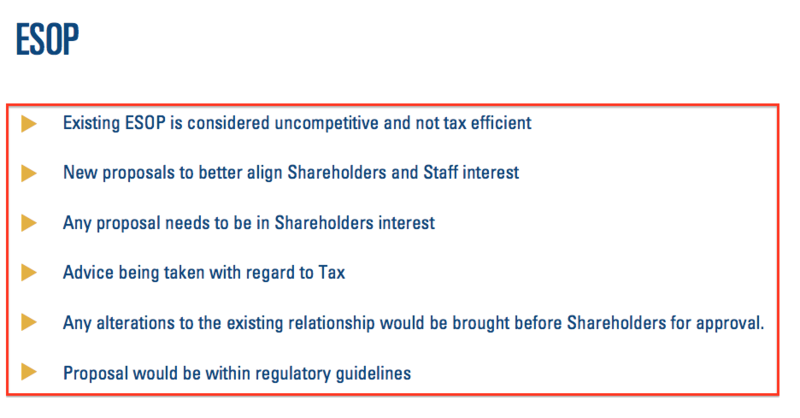 I just wish all quoted companies could be this timely when outlining their yearly performance. Note that CLIG’s RNS on the day did not point to the summary numbers. The group’s website carried a City presentation that included the figures as well as various other charts and stats. 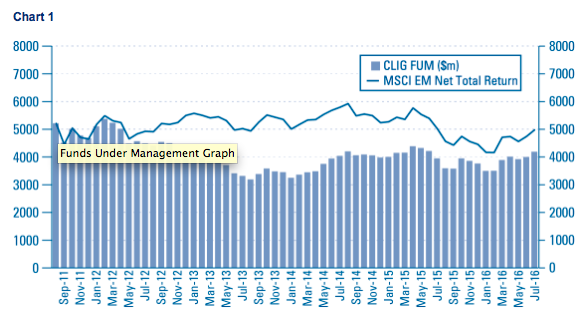 CLIG’s monthly website updates had already indicated the group’s funds under management (FUM) had dropped during the year. The statement confirmed FUM at the end of June was $4.0bn — down from the $4.2bn seen at the preceding year-end but up from the $3.8bn seen at the December half-year. My own monthly calculations following the interim numbers had indicated earnings could have been running at 25.3p, 20.0p, 22.0p, 26.8p, 27.2p, and 26.4p. Funnily enough, the mid-point between my low (20.0p) and high (27.2p) estimates came to 23.6p per share — which is what CLIG reported for the year. CLIG claimed a “positive investment performance” as well as “new and existing client inflows” had helped to mitigate the 12% drop in the firm’s benchmark index during the year. However, I note the amount of new client money collected was not as great as originally hoped. 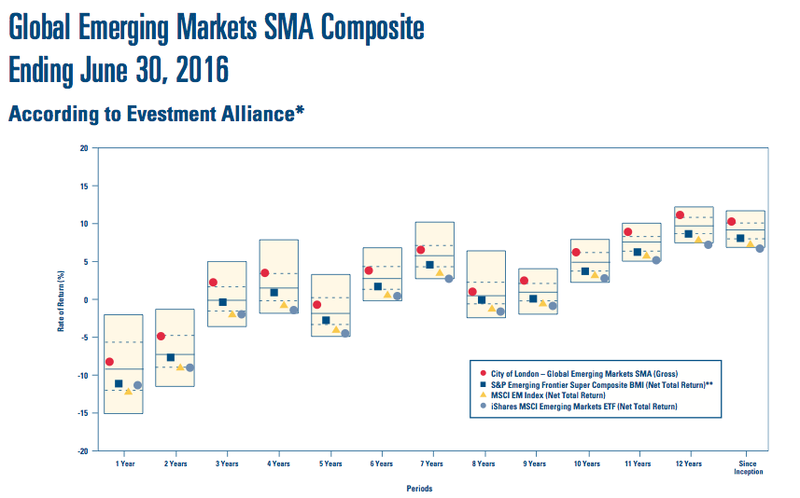 I suppose with emerging markets suffering a rough twelve months, some leeway with client wins should be expected. Nonetheless, it does go to show how precarious CLIG’s client-money assumptions can be. Another disappointment within the latest presentation was the downgrade for new client money expected for the current 2016/17 financial year. No explanation for the reduction was given. The shortfalls and changes to CLIG’s FUM projections does increasingly mean that its dividend-cover template is becoming rather academic. Given the sizeable difference between the original 2015/16 projection and the actual outcome — earnings of about 30p per share versus 23.6p per share — I’m not really too excited about CLIG’s upbeat dividend-cover forecast for 2016/17. However, the real driver of current-year earnings could be the weaker pound. 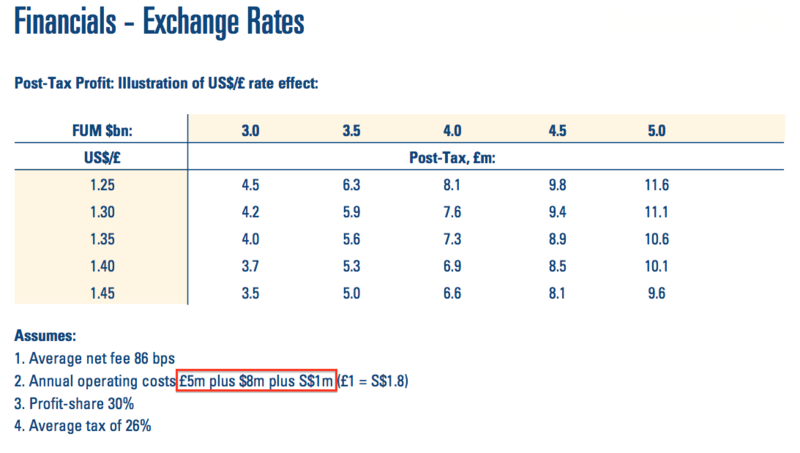 That currency set-up should benefit CLIG if the pound stays weak. I was disappointed to see CLIG owning up to greater operating costs ahead. 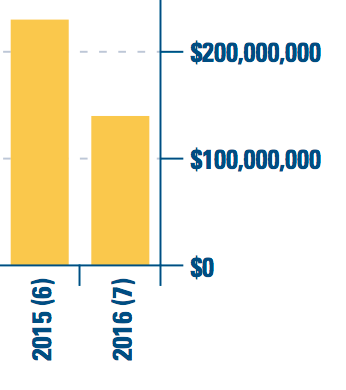 The rising cost base is also unhelpful when FUM this time last year was $4.2bn and now it is lower at $4.0bn. I suspect the staff have enjoyed a pay rise — unlike us shareholders, who have had to make do with a static dividend for six years now as FUM remains marooned. CLIG’s rising cost base may be accompanied by changes to the group’s employee share ownership plan (ESOP). The latest presentation once again suggested changes were on the cards, but no new details were offered. One highlight within the presentation was confirmation that CLIG’s own investment performance had remained relatively positive. My early sums indicate operating margins were a healthy 31% during the year, with return on average equity coming in at a robust 44%. 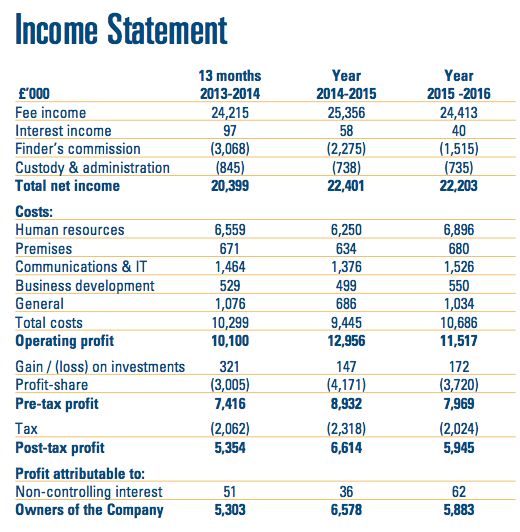 I will look at the accounts in more detail when the full annual report is issued in September. 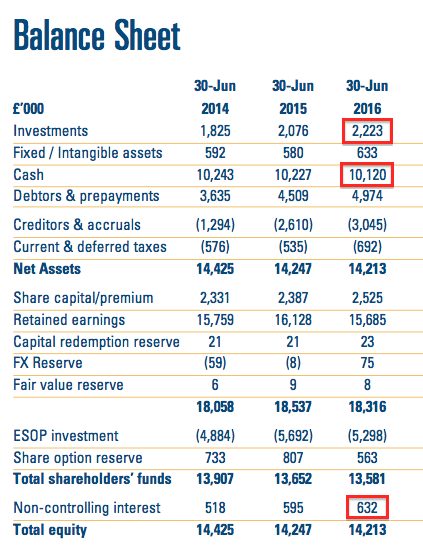 With £1 buying $1.31 and FUM at $4.0bn, I reckon current earnings could be running at £7.6m or 27.9p per share. 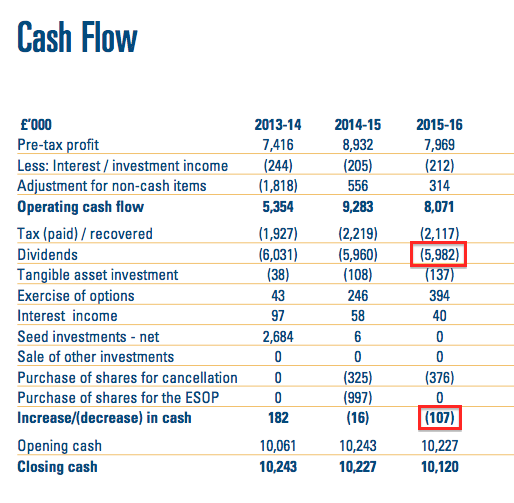 If actually achieved for the full year, £7.6m would be the best earnings result since 2012. Assuming net cash remains at around £10m or 39p per share, my enterprise value (EV) calculation for CLIG is £78m or 291p per share. Dividing that EV by my earnings guess gives me a possible P/E of 10-11. That multiple does not look outlandish at present, although bear in mind these shares have rarely traded at an extended multiple in the past. At least my 27.9p per share earnings guess underpins what is likely to be the seventh straight year of a 24p per share dividend — which currently equates to a 7%-plus yield on the 330p shares. 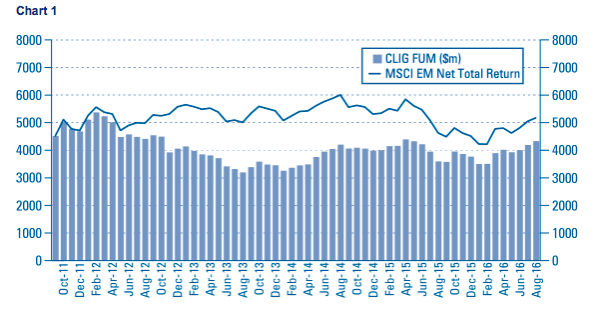 Great work as always, I’ve turned positive again on CLIG after reducing in August 2015. With a decent pickup in the MSCI Emerging Markets Index in July I expect the FUM to reach approx $4.2bn when next reported (early Aug). Whilst forward guidance is almost impossible in CLIG if it continues at that sort of level with the recent currency tailwinds we could have a decent year. Using the latest FUM/FX earnings table shown in the Blog post above, current earnings could be running at £7.74m — equivalent to 29.5p per share — with £1 buying $1.33. 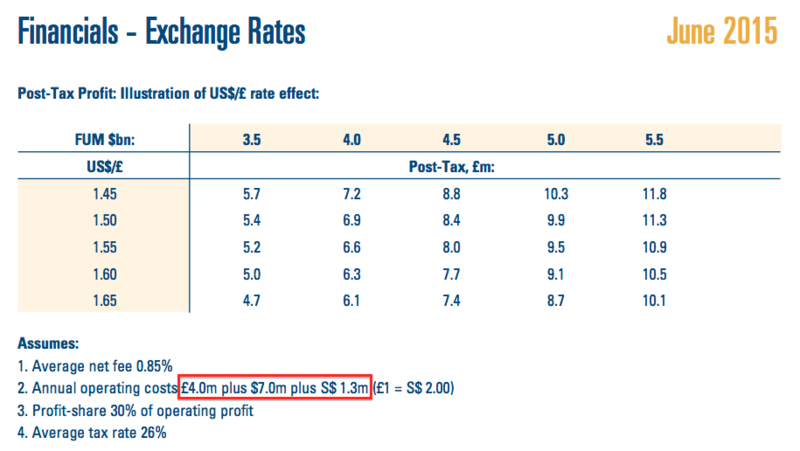 Using the latest FUM/FX earnings table shown in the Blog post above, current earnings could be running at £8.16m — equivalent to 30.4p per share — with £1 buying $1.34.